Barbara Joye moved to Atlanta from New York City in 1966. She taught college English for several years before serving in a series of public policy research and communications jobs for government and nonprofit agencies, including a year in Washington DC with the Safe Energy Communications Council. She recently retired from the State of Georgia’s Department of Human Resources, Office of Communications. She is married to Reid Jenkins. When she arrived at Vassar for her freshman year (1959-60) "I was disappointed that there were no progressive organizations on campus ­ until that spring, when students sat in at the Greensboro, NC Woolworths." The four (!) black students at Vassar organized about 100 of us to hold a solidarity picket in front of the Poughkeepsie Woolworths. I was thrilled by the realization that my actions, however small, could make a difference. A few weeks later I attended a meeting of northern student sit-in supporters, where I met my future husband, a democratic socialist who was working with Bayard Rustin¹s Committee to Defend Martin Luther King (King was being harassed by the IRS). I went on to start a Vassar chapter of Students for a Democratic Society and helped organize volunteers for the 1963 March on Washington for Jobs and Freedom. I was hooked on activism. In Atlanta Joye volunteered for the city’s “underground” newspaper, The Great Speckled Bird, the Atlanta Independent Media Center and the community radio station WRFG-FM. 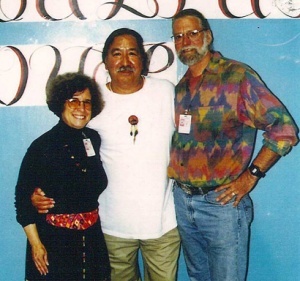 A veteran of Students for a Democratic Society and Movement for a Democratic Society in the ‘60’s, she has been active in various progressive groups, including an affiliate of the Mexico Solidarity Network, Amnesty International, Women’s Action for New Directions and the U.S. Social Forum. She is now in her second term as recording secretary for Metro Atlanta-Democratic Socialists of America and serves on the National Political Committee of national DSA. Five Metro Atlanta DSA members served as delegates to the Democratic Socialists of America biennial national convention, held in Evanston, Illinois in mid-November 2009: Jess Bowling, Barbara Joye, Barbara Landay, Milt Tambor and Jorge A. Lawton. Formed in April 2009 following a community forum at the First Iconium Baptist Church, By late 2010 the Atlanta Fighting Foreclosure Coalition represented 41 member organizations: labor unions; civil rights, civil liberties, human rights and peace and justice groups; homeless shelters; and faith-based organizations. Milt Tambor (Metro Atlanta Democratic Socialists of America). Plus the two YDS co-chairs, Sean Monahan (Philadelphia, PA) and Jackie Sewell (Lawrence, KS). Metro Atlanta Democratic Socialists of America delegates attending the November 11-13, 2011 National Convention in the Washington DC area included Barbara Joye, Jorge A. Lawton, Minnie Ruffin, Milt Tambor and Bob Wohlheuter. Those indicating intention to attend on Wherevent included Kelly Rhyne, Scott Darce, Angela Noel, Julian Harden, Julius John Hayden III, Erica Darragh, Mazlum Koșma, Kylee Reed Fulton, Dougie Hanson, Nick Langley, Daniel Hanley, Lamarcus Davis, Josh Thurmond, Barbara Segal, Melissa O'Shields, Adam Leonard, Adam Cardo, Steve Wise, Mandie Turner Mitchell, Asher Emmanuel, Tim Franzen, Joshua Collins, Jamie Mize, Rebekah Joy, Josh Martin, Steve Gill, Michelle Jones, Shelley Elise Berlin, Caroline Mask, Adriana Barros-Woodward, Debra Poss, Glenda Arrington Poindexter, Denise Woodall, Peggy Stentz Casey, Arletta Faheemah Saafir, Barbara Joye, Beth Ensign. According to Barbara Joye, January 30, 2017 started with a demonstration of solidarity with the Standing Rock Sioux protest against the Dakota Access pipeline (DAPL) that threatens a major water source and sacred sites. A crowd of about 500, including Metro Atlanta Democratic Socialists of America members Dani Atlanta, Barbara Joye, Daniel Hanley and Reid Jenkins, marched from a rally at Piedmont Park to another at the North Ave. MARTA station. Sierra Club lobbyist Neill Herring reminded us that the Sabal Trail pipeline under construction through our state will take gas from fracking in Alabama to Florida so utilities can compete with solar energy. Later, several thousand Atlantans massed and chanted for two hours in front of the south terminal at Hartsfield-Jackson Airport, protesting Trump's executive order excluding all refugees and banning citizens of seven Muslim countries from entering the U.S. Many MADSA members took part, dispersed among the crowd. Congressmen John Lewis and Hank Johnson, State Sens. Vincent Fort and Nan Orrock, State Rep. Stacey Abrams, and Mayor Kasim Reed joined us - though Reed's statement that Atlanta is a "welcoming city" sparked cries from the crowd for a sanctuary city, as advocated by speaker Azadeh Shahshahani, spokesperson for GA-J20, the coalition which presented that demand to Reed's office on Jan. 20 (MADSA is a coalition member). 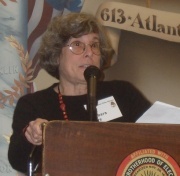 Barbara Joye supported the Democratic Socialists of America Unity grouping, established for the 2017 Democratic Socialists of America National Convention in Chicago. Metro Atlanta Democratic Socialists of America, was out campaigning for Vincent Fort on October 16, 2017. With Nate Knauf, Larry Pellegrini, Matthew Golden, River Grana, Megan Harrison, Krupesh Patel, Heather Marie Laveau, Josh Tuccio, Aaron Thorpe, Patrick Guinn, Matthew Wolfsen, Tyler Daws, Daniel Hanley, Barbara Landay, Bob Wohlheuter and Barbara Joye. In 2018 Barbara Joye was an original signatory of the DSA North Star founding principles statement. Members of Rainbow Roses Atlanta Closed Facebook Group, as of June 3, 2018 included Barbara Joye. ↑ DSA website, The Civil Rights Movement's Impact on Our Lives: Part 2DSA activists remember how their lives were impacted by Martin Luther King and the Civil Rights Movement. This page was last modified on 25 February 2019, at 04:24.